"Hi, I'm Duchess! 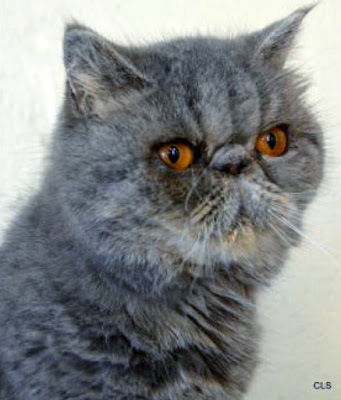 I'm an Exotic Shorthair cat full of fluff and weighing about 6 pounds. I was found, lost and alone, and luckily they brought me here to Wayside Waifs. I've been shown so much love and care and I have hope that my family will be here any day now to find me." "The peeps here have given me the the feline personality assessment and I tested out as a personal assistant. I'll make you wonder how you ever managed without a gal like me in your life, seriously! I'll be right by your side to help you with all your daily tasks. I'm a great companion." "My favorite toy to play with is my toy mouse. It's so much fun to chase after! Once I warm up to you I'll make sure to give you plenty of head butts and let you know how much I love you with plenty of purrs. I hope that you'll return the favor with plenty of petting, my soft, grey coat is perfect for it! Duchess is 10 years young. She's old enough to be over that crazy kitten manic behavior, and also old enough to know what she wants in a human. We hope someone understands that - even though 10 is considered "senior" - it doesn mean there aren't loads of years this girl has left to spend loving her human! Please share this girl - she's available at Allie's Alma Mater, Wayside Waifs! Oh no, Duchess, how could such a beautiful purebred kitty like you wind up lost and abandoned? I know it happens, but it's so hard for me to believe. I hope you find a good home soon. 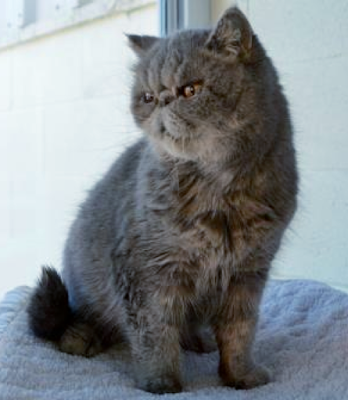 Duchess, there can't be many more exotic shorthairs hanging out with out at Wayside Waifs. Your good looks and winning personality are bound to help you find a loving family who loves you bunches. Paws crossed it's soon! Could you be any cuter??? You are so unique that you're sure to find your forever home very soon! what a lovely girl!! we bet her family shows up in no time flat!! Such a lovely lady deserves the best home ... sure hope she gets one really soon! I love her little smushed in face. I have a thing for gray cats....I had one. He was named Ghost I was so sad when he died. Your eyes are such a beautiful deep colour, Duchess. I hope you very soon get your new forever home. She is beautiful, I hope she gets a forever home soon.